Those of us with dermatographia–or skin writing–stick together. We share our experiences of it and tips for how to take care of it. Plus, dermatographia is a good way to meet people, because folks think it’s cool and want to learn more about the welts. Jes Blackwell here, yep…I thought for a very long time this condition sucked! Being an awkward, dorky, queer outcast in highschool (in Wisconsin) was enough of an ordeal that I had to live with, but every time I had a tiny little itch on my face and I wasn’t thinking… BLAM!! A gigantic welt would appear on my already hormonally confused face. Needless to say…I did not date. It wasn’t all bad though, playing tic tac toe on my legs during long car rides to Indiana, getting my sister in trouble…etc. However you really do have to plan out whether or not you should pop that zit now or wait till you have about 30 minutes to hang out all puffed up. It actually wasn’t until I met Ariana that I even remotely thought of this condition as something “special” or even…dare I say “cool”. To write on the skin…well when you put it like that, it sounds alright. 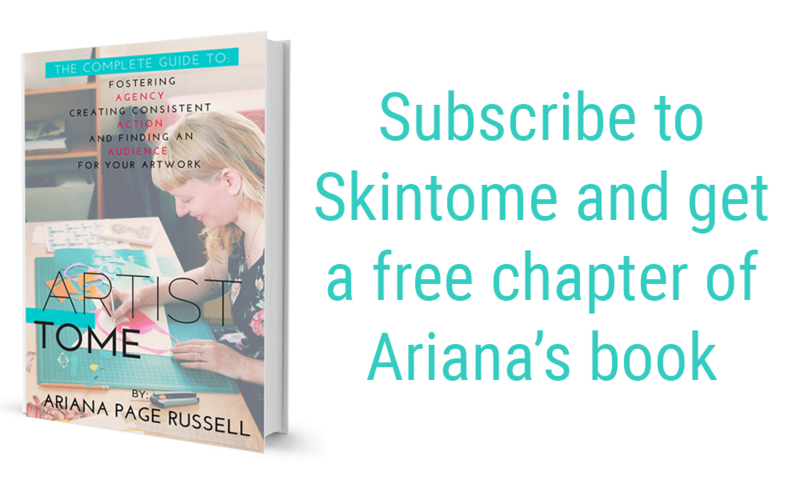 Ariana told me how she works with her skin to create…to create beautiful pieces of art. I haven’t been making art with my skin but I have gotten as far as writing a love note on my stomach for someone special or (as pictured above) demonstrating to co-workers what it does. And here’s the best part, EVERYONE thinks its cool as hell! So, I’ll take it. And the BIGGEST thank you to Ariana for changing my perspective on the condition by teaching me about how it works, how many of us have it, and how awesome it actually is. Thanks Jes! It takes an army of us to change the context of dermatographia (from an embarrassing condition into cool, unique skin), and you are showing everyone you’re proud of what your skin does that makes you different! Also, I realize some of us with dermatographia do not think it’s cool, because it’s extremely uncomfortable (never mind embarrassing), and actually hurts and itches to the point of drawing blood from scratching so much. I am so sorry for your pain. Please speak with your doctor about this, and seek other treatments if your antihistamines aren’t working (sometimes you need to change the dose and/or type). There are also natural treatments that I’ve found to be very helpful. I write about my experience here. I think Jes sums up a lot of my own personal experiences with being a skin writer. At first I was ashamed…worried about unconsciously scratching an itch in public or people staring at me in horror as mysterious lines crossed my forehead on the subway. In all honesty, I was first a little upset when I came across a story on Ariana and her art. Something so embarrassing and so uncomfortable being turned into something creative and marketable? I felt like my skin was being exploited…but shortly after, through Ariana’s work and raising awareness, my skin should be exploited. It is cool! It is a novelty! It is special! Why shouldn’t it be embraced, celebrated and shown off? Thank you Ariana…thank you Jes for sharing your story. We are all united by our skin! Love this site. Have had moderately severe psoriasis since age 13 — spent my teen years coping with people’s horrified looks as well as pain, itching, and everything being bloodstained. Have always been itchy and rashy and have known about dermatographia for years but only after seeing some of the beautiful skin art have I started actively trying to skin write, to turn my skin into canvas, to embrace it. Thank you!! I’ve never met anyone else with dermatographia, and definitely didn’t know there was a support system for it! Nice to know I’m not alone in the world…mine started about 7 or 8 years ago. I am happy to know some people also have this skin writting..i just suffered it this year on february..i have to eat medicine everynight to control it..
Its so itching..i dont know mine also bad or not..hope isnt bad..i try to reduce my medicine dose..
That’s awesome Gina! Thanks for letting us know 🙂 Oh, and I used to have acne when I was younger but it was never too bad.